In Fiji, a GEF Small Grants Programme project supports the Uto ni Yalo Trust, which aims to prove that low carbon wind-powered ocean transport is still viable. As a navigator Setareki appreciates the fact that ‘to begin, you must know where you are and where you are heading’. Aboard the boat, the crew sees and feels firsthand the effects of climate change and the extensive threats to the ocean. Vulnerability becomes visceral without protection from the elements. Life aboard the boat is a microcosm of life in Pacific Islands, including the lack of a margin for error. But the threats and limitations also suggest possibilities and a course set for sustainability, with a greater respect and sense of stewardship - encouraging better solutions for a healthy ocean. To promote the sustainable, reciprocal relationship with nature, the Uto Ni Yalo is encouraging solutions for a healthy ocean – and gathering trash on the remote islands it visits. Uto ni Yalo (which translates to ‘Heart of the Spirit’) is one of nine traditionally designed sailing canoes being used to promote a sustainable, reciprocal relationship with nature. The seventy-two foot double hulled vessel, Uto ni Yalo (which translates to ‘Heart of the Spirit’), is being used to revive and sustain traditional Fijian canoe building, sailing and navigational knowledge, skills, and customs. This ship has sailed open-ocean voyages along ancient Pacific trade and migratory routes to help re-establish historical ties and significant cultural links with people all over the Pacific. The Uto Ni Yalo is one of nine traditionally designed sailing canoes that are backed by the German philanthropic conservationist group Okeanos Foundation for the Sea in partnership with Pacific experts across the region. Additional support for the Uto Ni Yalo has been provided through a successful application to the Small Grants Programme (SGP). The SGP, funded by the Global Environment Facility (GEF) and implemented by UNDP since 1992, has been supporting projects around the world that conserve the global environment while enhancing people's well-being and livelihoods. Building on this grant for the Uto Ni Yalo, entitled Piloting Low -Carbon sea transportation model for Fiji using traditional voyaging services in rural island routes, the SGP plans to expand this type of support to other traditional ships in the region – working with partners to develop a sustainable transportation network in the Pacific. The Uto Ni Yalo’s formal and symbolic uses - attending events, performing, inspiring, proving carbon free travel is possible – are complemented by utilitarian functions, such as taking relief supplies to islands after tropical cyclones. Following Tropical Cyclone Keni in April of 2018, the Uto Ni Yalo was used to deliver relief supplies to a province that suffered nine deaths, as well as the complete destruction of whole villages, plantations, and boats. Meeting periodically with its sister ships around the world, the Uto Ni Yalo has made appearances in Hawaii, Sydney, Auckland, and throughout the Pacific. For example, at the IUCN World Parks Congress in 2014, the Uto Ni Yalo sailed in to Sydney Harbour as part of the Okeanos supported fleet. The Uto Ni Yalo is also designed to demonstrate that the shipping routes that were previously thought to be economically non-viable can be re-established, thereby reviving access to these islands, restoring their importance, and providing opportunities for the youth living there. Around the world ≈90% of all goods and raw materials are transported by sea using vessels powered by fossil fuels. Through funding from the GEF SGP, the Uto ni Yalo is demonstrating how low carbon sea transport can offset Fiji’s fossil fuel reliance and become a viable option for cargo transfer from remote maritime islands. Since 2010, it has sailed over 80,000 nautical miles to over 15 countries in both the southern and northern hemispheres. 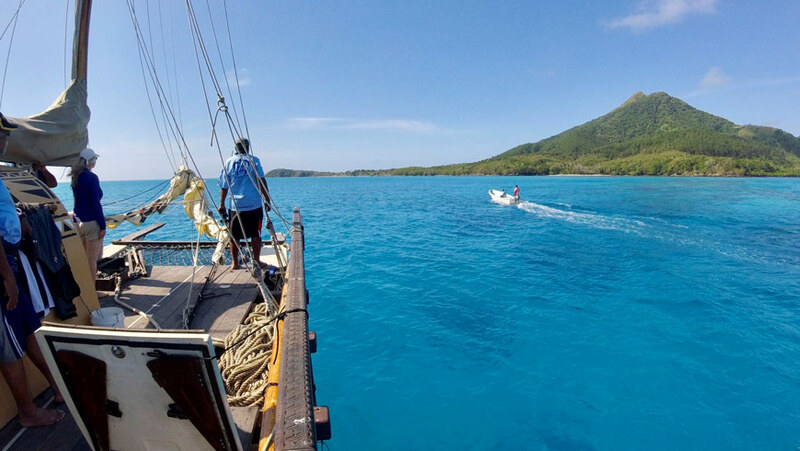 To further increase the utility of the ship’s island visits, the Uto Ni Yalo Trust has committed to collecting data on waste found on village foreshores. At each stop, the 16-18 member voyaging crew conducts beach clean-up along the shoreline in order to understand the types and quantities of non-biodegradable waste found, and present this information back to the community with options for safe disposal. Given that the highest densities of plastic pollution on earth are found in the Pacific, with serious consequences for wildlife, ecosystems, economies, and human health, it is an urgent problem requiring both local and international efforts. As part of these efforts to combat plastic pollution, in 2017 alone the Uto Ni Yalo facilitated the collection and safe disposal of more than 2,000 kilograms of trash in marine environments. SGP funding has allowed the Uto ni Yalo to spur action, advance conversations, and promote unity in a country that is widely dispersed geographically, comprised of over 330 inhabited islands. Thirteen million tonnes of garbage enter our oceans every year and 5 trillion plastic bags are used annually worldwide every year. It will take the combined efforts of ships like the Uto Ni Yalo, residents of Pacific islands, and the wider world to turn this toxic tide. While the boat itself is profoundly practical, it is also a tool for reviving handicrafts and celebrating traditional art forms - both on the boat and in the communities it visits. Traditional ingenuity and knowledge remain clearly visible, with the twin hulls cunningly connected by wooden beams and lashed only with rope. Each vaka is finished with intricate traditional designs, and carved by a third-generation carver. In essence, the boat also serves as a floating art exhibit; 18 Fijians have contributed 168 pieces of mixed medium art toward the floating exhibition, marrying form with function. In total, since 2003 when SGP support in Fiji began, there have been 150 projects undertaken across the country. By providing financial and technical support to projects that conserve the global environment while enhancing people's well-being and livelihoods, SGP demonstrates that community action can maintain the fine balance between human needs and environmental imperatives. For more information on this specific project, please visit the Uto Ni Yalo Facebook page. For more information on SGP-supported projects in Fiji, visit the Fiji Country Page. Visit the SGP website for details on the overall Small Grants Programme.